The LABC Building Excellence Awards reward excellent buildings, outstanding companies, and partnerships and individuals that go that extra mile. 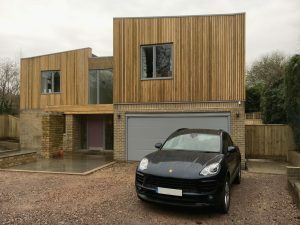 Our project was conceived as a near-zero-carbon dwelling and we worked hard to produce a design that satisfied our clients desire to have a modern, sustainable home, within the constraints the site presented us; these ranged from the Green Belt cutting across the site, the site bordering a conservation area to having a historic stone dwelling in close proximity and contending with an incredibly high water table during construction. Chloe Ellison of LABC remarked that ‘competition has been stronger than ever this year and being shortlisted is a great accomplishment’. We have our fingers crossed for our clients that the project will win the regional award and go on to be entered into the Grand Finals later in the year. It is recognition of the time, effort and expense that they have invested into building their new home.